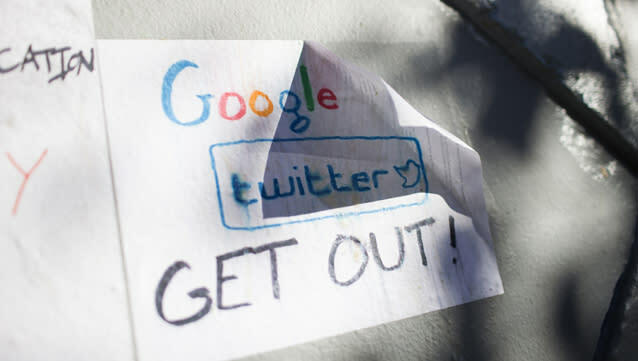 Simmering class tension in San Francisco hit a new level yesterday when protesters stopped a bus that Google hired to transport its workers from the city to Google's headquarters in Mountain View. Some San Francisco residents have complained that the success of the search giant and other Silicon Valley companies are driving up real-estate prices in the city — and driving out those who don't happen to work in the booming tech industry. In recent months, this frustration has increasingly been trained on a highly visible symbol of this disparity: The Google buses. Yesterday's protest, which was undermined by a protester who pretended to be a tone-deaf Google employee shouting at the other protesters, led to one of the Google buses being temporarily stopped. Not long ago, Google's buses were perceived as a responsible, helpful perk that allowed Googlers to work on their way to work (the buses have WiFi) and helped the community and environment by removing lots of cars from the road. Now, however, the buses symbolize one of the most important and depressing trends in the world today — the growing gap between a handful of "haves" and the vast majority of "have nots." Income and wealth inequality is increasing worldwide, especially in the United States. In fact, in the U.S., income inequality has hit a level not seen since the 1920s in which the best-compensated of the country are taking home 90% of the growth in national incomes. (See: The New America: 3 Million Overlords, 300 Million Serfs). This increasing inequality is the result, in part, of a business culture that has evolved to value profit above all else. This profit obsession is discouraging companies from reinvesting more of their vast profits in new projects and products and in better compensation for their rank-and-file employees (fast-food workers, for example). As a result, wages in America have now hit an all-time low as a percentage of the economy, while profits have hit an all-time high. The frustration with Google's buses is misplaced — they're helpful to the community, not harmful, and the employees inside them are as much a part of San Francisco as everyone else who lives there. And, unlike many companies, Google does invest a significant amount of its profit in compensating employees and launching new projects. But the larger issue — increasing inequality — is not going away. And yesterday's protest in San Francisco is likely only one of many that we will see over the coming years.